All dens are tunnels near or underneath cut tree trunks. Darksun glanced away from the once-was forest floor as she heard a voice from nearby. The dark pelted she-cat turned her head in the direction of the source, before finding out it was only Whitesplotch, her clan's medicine cat. I always thought she was a bit young for a medicine cat........it was hard for her after her mentor died so soon after she began her training, and she still is keeping the secret of her crush on our clan's deputy even though any smart cat could see she has one, the warrior thought in her mind. 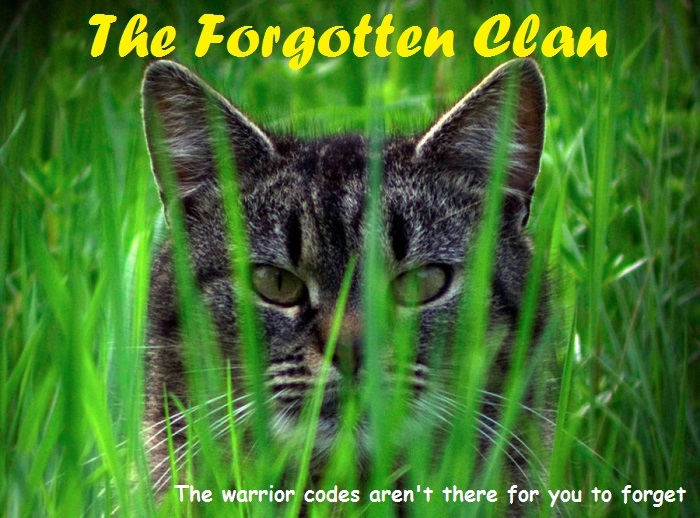 As she heard Whitesplotch's words, she understood why the she-cat would be so worried about the other four clans' reactions to Deathclan. "Perhaps if the clans found out that we are more like them than BloodClan was, they'd understand that we mean them no harm." Darksun suggested as she padded up to the two she-cats. Whisperstar ended up falling asleep in the nursery. She awoke hearing Darksun voice. She stood up and stretched out with a quiet yawn. She looked at Darksun thankfully before leaving the nursery. It was an awful idea to fall asleep. She jumped onto a stump and sat down. She looked around at her clan. Wait, what moon is it tonight? She wondered and headed off to her den. Darksun went to feed the queens some more fresh-kill when she noticed a white and gray kit with one of the queens. "Who's kit is this?" she asked the queen, and then learned that her leader had brought the kit into camp not telling her who the kit's parents were. Hmmmm, seems suspicious, I better ask her about it, she thought to herself before she padded out of the nursery and towards the leader's den. "Whisperstar? I heard from a queen that you brought a kit into camp. Who's kit is he? Who's the kit's parents?" she asked into the den, her tail lashing out. Tenebrae wasn't sure how long he had slept, but when he woke he could feel a warm body against him. Am I back home? he thought before he remembered the silver tabby cat who found him at the dead tree. At the memory, he sprang up, panting in fear. "Where am I?!" he mewed frantically, glancing around with wide eyes. Whisperstar peered around the edge of the den, exiting the shadows. She looked at her deputy then at the nursery. "Oh it's a kit I found in a dead birch. No parents around. Stale scent. I had to take him in." She sighed feeling a strange pang in her heart, something unfamiliar but not guilt. "A warrior mustn't ignore the needs of a kit. Clan, loner, or rogue. Besides, I bet he'd make a brilliant warrior." She smiled lightly and shook her head. "Is there anything else you need?" Darksun listened before she lowered her head in shame. "I know that warrior shouldn't ignore the need for help from lone kits but still, he smells like a kitty-pet, how do we know his Two-legs aren't looking for him? If they come to our camp we'd have to run away! I don't hold a grudge against kitty-pets, for Whitesplotch was once one and she's made an excellent medicine cat, but what kind of warrior could he make?" she asked the leader before her ears twitched backwards upon hearing the kit's frantic mews. He must've woken up now! she thought. "It seems he's awake now." she added in a mew. "A great warrior." She mewed plainly and brushed past the warrior. She brushed her tail underneath Darksun's chin, signalling for her to raise it. "A twoleg wouldn't come looking for him. A kit his size, they would think he was dead. Besides, look on the bright side of things." She smirked with a small shrug before walking over to the Nursery. She slipped through the entrance and looked down at the fretting kit. Tenebrae nearly jumped out of his pelt as the silver tabby she-cat from before entered the same den he was inside of. "W-w-where am I?" he asked her in a tiny mew, stuttering fearfully. "Who is she? Who are you?" he asked in addition to his first question that he had repeated. His fur bristled and his blue eyes told them he was clearly in complete shock and fear. Fear-scent wafted through the air around his furry body. Whisperstar crouched down to the kits height and looked at him in the eyes. Her violet and blind eye glistened as she saw into his wide blue eyes. "Hush now, little one. There is nothing for you to fear." She cooed and sat up straight. She place a paw under his chin lightly and tilted his head up. "I am Whisperstar. You are in a nursery located within Deathclan camp. If you think you are in danger, you aren't. I don't expect you to remember but I found you in the dead birch and brought you here." She removed her paw and plopped herself down. She smiled slightly, trying to set off a nice atmosphere instead of a dark, evil one. Berryleaf leaned against the walls of the nursery. Snowkit and Pinekit were nestled at her side, watching. Snowkit was the whitest kit you'd ever see even if she has black markings and lime eyes. Her brother looked like her mother; oak pelt, amber eyes, and chestnut mittens. The two kits exchanged glances. Pinekit's gaze seemed more stern and judgmental than Snowkit's. Her's was more excited and joyous. Snowkit looked at her mother with a smile then at Whisperstar and the kit. The urge of bursting out and wanting to play was so hard for the tiny white kit to control. She extended her claws a scratched at the ground. Pinekit looked down at her a shoved her slightly with his shoulder. Snowkit settled. She plopped her self down on her mothers paws, waiting for a chance to burst out and greet the new kit.